So far we've only seen Billy Batson's Shazam all powered up, but a new piece of Shazam! movie merchandise gives the whole Shazam! family the chance to wield their powers and costumes, suggesting it could make it into the movie. A new image for a Shazam! giant activity pad showed up on Wheelersbooks.com, and the cover features the movie logo right in the center. As you'll quickly notice, it also features a variety of stickers on The front, which just so happen to include several members of the Shazam! family from the comics, including Darla, Freddy Freeman, Pedro, Mary Marvel, and Eugene, along with Sivana and Shazam!. The image is smaller, so it's hard to tell if the Shazam! sticker is based on Zachary Levi's version or not, but at first glance, it appears it does. If that's the case, along with the movie logo, it could mean Shazam won't be the only one getting powers by film's end. We know the family is in the movie too and will be brought to life by Jack Dylan Grazer (Freddy), Grace Fulton (Mary), Faithe Herman (Darla), Ian Chen (Eugene), and Jovan Armand (Pedro). Now, that doesn't mean they will certainly get powers in the movie mind you, but man what a great end credits scene to lead into a sequel right? As for the giant activity pad, it hits stores on March 1st, 2019, and you can check out the description below. "Colour and complete activities featuring Shazam! 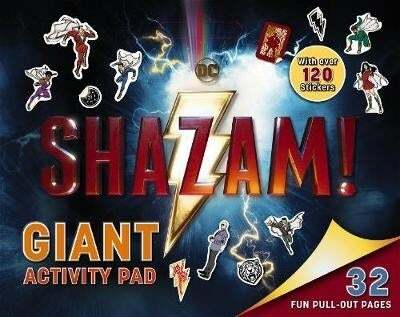 This giant activity pad includes a cut-out carry handle so Shazam! fans can take the activity pad with them on their own adventure." Shazam! is directed by David F. Sandberg, and you can check out the description below. Shazam! hits theaters on April 5th, 2019.